The method, developed by Air Danshin Systems Inc., the method is radically different than conventionally employed dampers and band isolation systems. 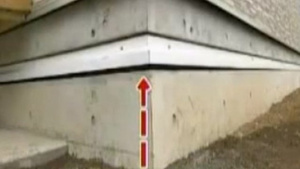 When the quake strikes, it activates a sensor on the property. 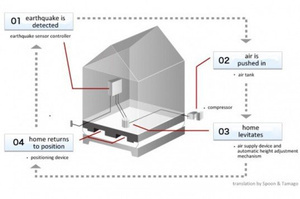 This sensor then activates a large air compressor that forces air into a bag situated in the home's foundation. As pressure builds, the home will levitate 3cm and gently ride out the shaking, safe from the tremors below. Homeowners can also steady the home as it floats by using an indoor air valve. As the shaking subsides, the house settles back upon its foundation.